The next step in DIY printed circuit board (pcb) fabrication after designing the pcb layout and etching the PCB is drilling the holes. Drilling holes was much easier than I anticipated, probably because I chose the right tools. I needed mini carbide drill bits and a Dremel drill press / workstation or one like it (recommended by one online forum for DIY PCB fabrication). The cheapest source I found for drill bits was this 50 piece grab bag from Harbor Freight, which took forever to arrive. Still, it contained a number of useful sizes for PCB drilling. The commonly used sizes appear to range from: #71 (0.026" / 0.66 mm) through #56 (0.0465" / 1.18 mm). They work beautifully. I already had a Craftsman rotary tool and chose the matching Craftsman drill press for $40. Some suggest these hobby drill presses have too much side to side slop and will break drill bits. After drilling hundreds of holes in dozens of boards, I disagree. I believe the mechanism is tight enough and easy enough to use for PCB drilling. In the picture below, you can see the rotary tool, drill press, drill bits, PCB, and a drilling map I made to tell me what size holes to drill and where. Not all holes in the PCB are the same size. 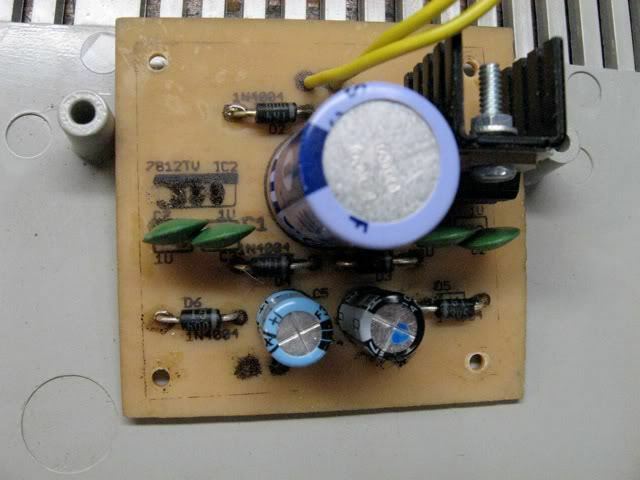 Larger power devices like rectifier diodes and regulators use larger holes than, say, tiny capacitors or 1/8W resistors. If you're new at this, here's a good way to get started. Hole sizes are automatically captured by Eagle based on the components' packages. After creating your PCB layout, Eagle can generate Gerber and Excellon NC drill files, normally used by a drilling machine. The files needed translating to a human readable format: a drill map like the one below. 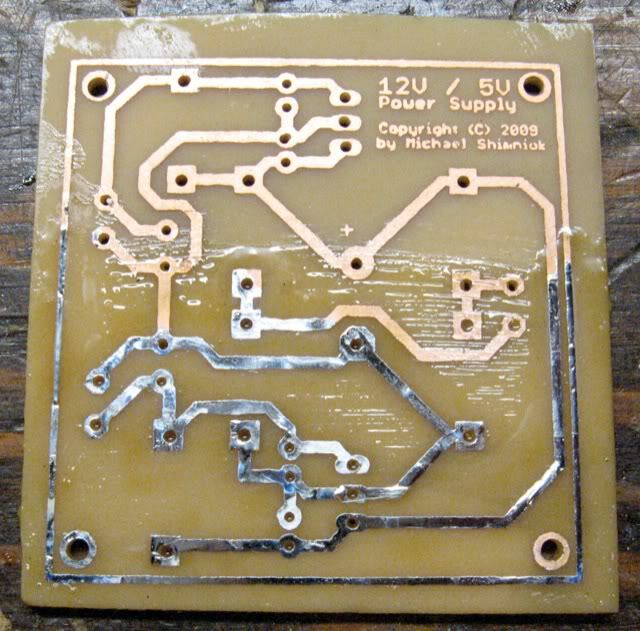 Here's an example NC PCB drill file. All the NC codes can be found here. How do we get from the NC drill file to the pretty map above? For starters, the file defines drill sizes (0.028" and 0.032"), then for each drill size, a list of X,Y coordinates is listed for drilling. 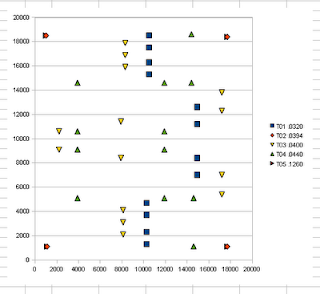 If we translate the NC drill file into a comma-separated file format (.csv), we can use Microsoft Excel and OpenOffice Calc to plot x,y points in a scatter plot that then becomes a map of your PCB's holes. I wrote a fairly simple perl script (download here) to convert the NC drill file into a .csv. Each set of holes is described by two columns for X coordinates and Y coordinates. And each pair of these columns has a heading with the drill size. The pairs of columns (holes) for each drill size appear left to right. Simply create a scatter plot using multiple data series with each series corresponding to the set of holes for a given drill size. Make sure the name of each series contains the drill hole size. You'll end up with a chart like the one I've included above. 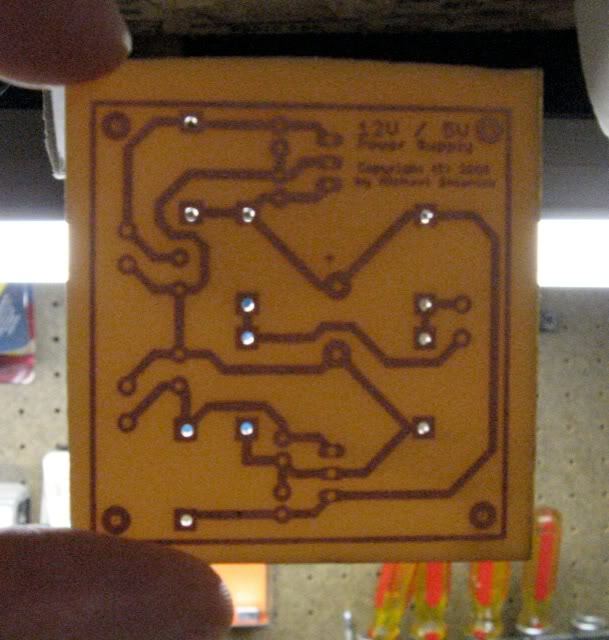 Note that your PCB drill map is a mirror image of your PCB! After you've done this a few dozen times you can eyeball the PCB pad and determine a reasonable drill size. The quick and dirty approach for selecting drills: use ~.027" bits for small holes like 1/8 watt resistors or small caps, ~0.031" bit for medium like transistors and 1/4 watt resistors, and ~0.038" for big holes like pin headers and 1/2 watt resistors. Pick a drill size (slightly larger is better than too small, like 0.042" for 0.040") locate the holes of that size on your PCB chart printout, map to the actual PCB, and drill away. Don't do anything dangerous. Use eye protection. Be safe! Your safety is YOUR responsibility. I was able to pretty easily line up the drill bit with the hole. Set the drill height fairly close to the board to make it easy to line up. Use lots of light, too. The wickedly sharp drills running at high rpm cut through the PCB like butter. I don't tend to drill slowly or linger. It seems to work best drilling the PCB quickly. Half a second at most in a smooth motion. It was far easier than I expected. The right tools make any job easier. You might want to tin the traces after drilling to prevent corrosion over time. I slathered plenty of paste flux on the traces and applied a very thin layer of solder to each of the traces as well as the lettering. This prevents the traces from tarnishing. I recently learned that paste flux can be washed off with mineral spirits, leaving a clean board behind. I use a toothbrush dipped in the stuff. 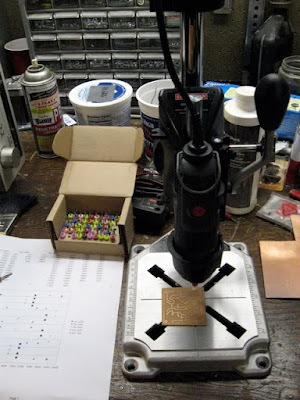 The pcb mounting holes are too big to drill with any of my mini drills but I decided to drill pilot holes using my biggest bit and then chase those on my larger bench top drill press. I now generally standardize on #4 size holes and have a drill bit that works great for this size. 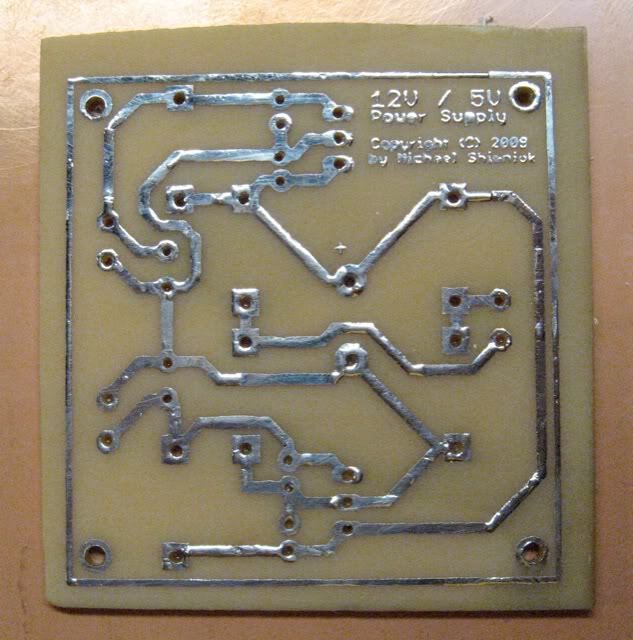 While it would be really swell to trim the PCB square and pretty, I lacked tools and techniques on this first board. A dremel with a cutoff wheel is slow and throws dust everywhere. I now use a bench top belt/disc sander from Harbor Freight. It's fast and I get nice square edges. I decided to put a "silkscreen" layer on the top of the board using laser print transfer. Do this before you add flux! The results were acceptable and the labels were a big help in swiftly populating the board. And that's it. I'm done! 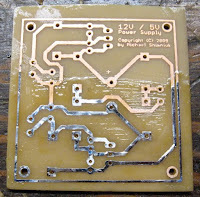 It was really satisfying fabricating my very first PCB! Since then I've designed and fabricated many boards. Had I known it was this easy and cheap I would've tried it a long, long time ago. hey where did you find the pcb layout from? 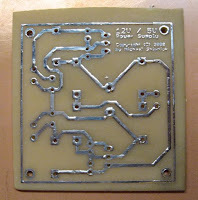 I designed the circuit and circuit board layout using Eagle CAD software.